Jeff Daniels: Anchoring The Cast Of 'The Newsroom' The actor stars in Aaron Sorkin's new HBO drama The Newsroom, playing an anchorman inspired to give up fluff pieces and return to hard-hitting journalism. 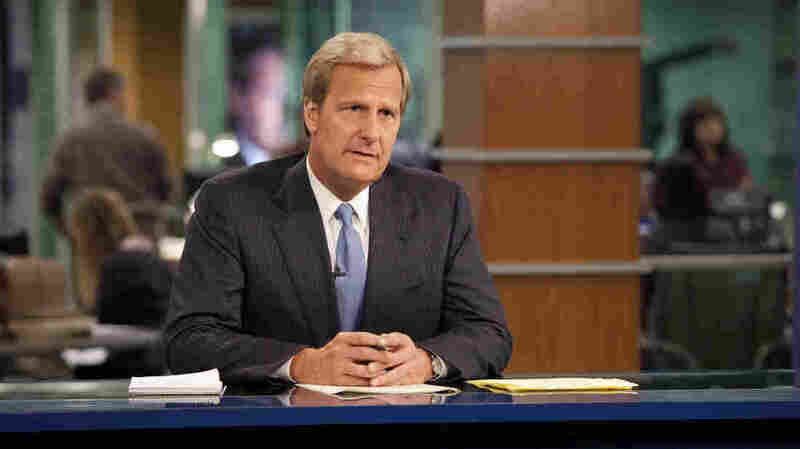 Aaron Sorkin's new HBO drama The Newsroom revolves around Will McAvoy (Jeff Daniels), a popular cable-news anchor floating happily along with his nightly newscast, which does well in the ratings but doesn't tend to delve into anything that could offend or alienate anyone. After McAvoy has a public meltdown at a university lecture, he's put on a three-week hiatus by his boss (Sam Waterston). During McAvoy's time off, his staff defects and a new executive producer named Mackenzie McHale (Emily Mortimer) is hired to take the helm of McAvoy's show. But there's a back story: McHale and McAvoy used to date years ago, and now McHale wants to shake things up, with a new show anchored by McAvoy that tackles real hard-hitting news stories and calls out those who don't tell the truth. It's a typical Sorkin drama, complete with fast-paced dialogue, witty storylines and top-name actors, including Daniels, the star of such films as Dumb and Dumber, The Purple Rose of Cairo and The Squid and the Whale. Daniels, who calls himself a political news junkie, tells Fresh Air's Terry Gross that he started watching cable news during the 2000 presidential election, and now has even a greater understanding for how the shows run by news anchors work. "There's certainly an awareness of what these guys do, and what they do well," he says, "when they really earn their money — breaking news, and being able to stay on the air and cover things and just keep talking — and to do it in a way that's factual without diving too deep into speculation." In an early episode, Daniels' character calls out other news anchors for their willingness to play to their base and spin stories to attract ratings instead of reporting on actual news and events. That's something Sorkin feels very strongly about, says Daniels. "Aaron will tell you that he's an idealist, he's a romantic, and he thinks there is a place for truth in journalism — and there is a place for ideals," he says. 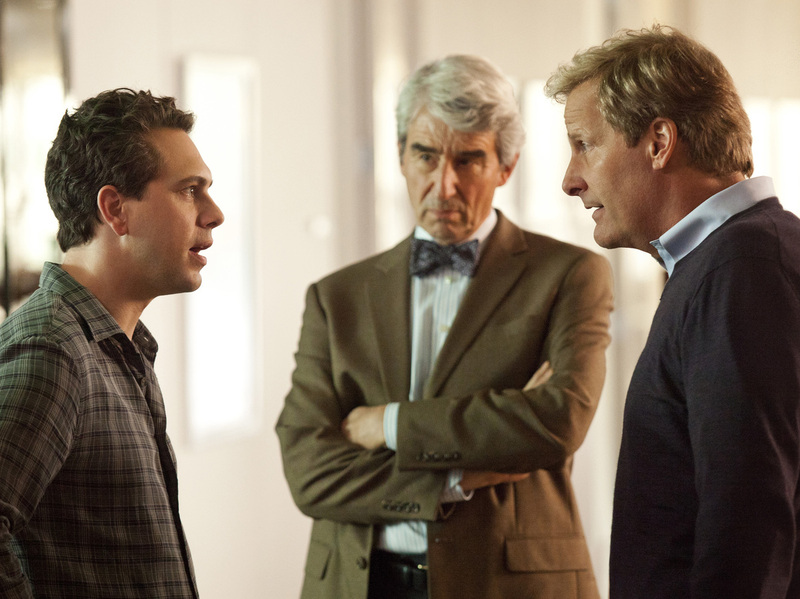 In addition to Daniels, the ensemble cast of The Newsroom includes Thomas Sadoski (left) and Sam Waterston. Daniels describes being on set at The Newsroom as like being thrown "into the middle of a six-lane highway." There were HBO cameras filming newsroom cameras which were filming Daniels, who also had a series of TV monitors behind him. "You're sitting right in the middle of it in a chair, and the traffic is going all around you on all sides," he says. "You understand how to do it, you get better at it, but I got an awareness and admiration for the guys who do that on a nightly basis who are able to keep [everything] straight and know where to look and where the guest is and which screen to go to and read the teleprompter." Working with Sorkin has been especially gratifying for Daniels, a huge fan of Sorkin's drama The West Wing. "When I met Aaron, I told him not only did I watch The West Wing, but when it went into syndication on Bravo, I would watch each episode two or three times just to see the mechanics of how he puts a story together," he says. "He knows how to do that. The great ones do." "He said, 'Look right in the middle, and out of the corner of your eye, read from left to right, but try to look right down the middle of that prompter and it won't look like your eyes are going left to right, left to right.' "
We all can become anybody. Actors are just given the tools on how to draw that out and become someone else. It's kind of legalized schizophrenia. "When they get their 'go-to' guests, you almost know what they're going to say before they say it. But when they get that new guy — that rogue guest who comes in and goes off message, which allows a Chris Matthews or a Sean Hannity to come in and pounce, I can see it in their eyes. It's interesting to know pretty much what's being whispered in their ear by their producer in the middle of an interview — to know when they go off on Sarah Palin, depending on which show you're watching, that's either going to be good for ratings or bad for ratings. It's almost like science or math, the way these folks approach it." "He certainly knows Keith [Olbermann]. He knows Chris Matthews. Larry O'Donnell was a consultant on The West Wing. And certainly the producers did a lot of research hanging out scouting the CNN newsroom to get a set replica. But when they brought me on, no one ever dropped a name saying, 'Him. Follow him. Be him.' It was more, 'Let's create our own guy and see if we can't fictionalize somebody.' "
"If you do it at the proper pace, it sings. It's like a verbal car chase. This isn't an action series; we're not pulling guns on each other or having cars come around corners. But we go after each other, and when done properly and at the right pace, it can be very compelling — almost like an action sequence." "We all can become anybody. Actors are just given the tools on how to draw that out and become someone else. It's kind of legalized schizophrenia." "I love that on Fresh Air we're talking about Dumb and Dumber. ... Certainly the toilet scene was a challenge. As I told the director, 'This is either the beginning of my career or the end of it.' I think the actual act of what happens on the toilet, I think they had cut it down to 30 seconds, but there were takes that were two, two-and-a-half minutes long of just pure agony. ... There were times, I think there's one close-up where I'm pushing so hard that I almost passed out. I almost fell off the toilet. And I'm pretty sure they used that shot. The career was at a crossroads when that scene was finished." "We wanted to raise our kids in a place we understood. And that made me get on that airplane and take red-eyes back and forth every two weeks or so. It made me spread the career around to supporting roles and get off the Oscar trail of trying to become the biggest star in the history of stars. Family just became more important. The career was second — it was a close second, but it was second."